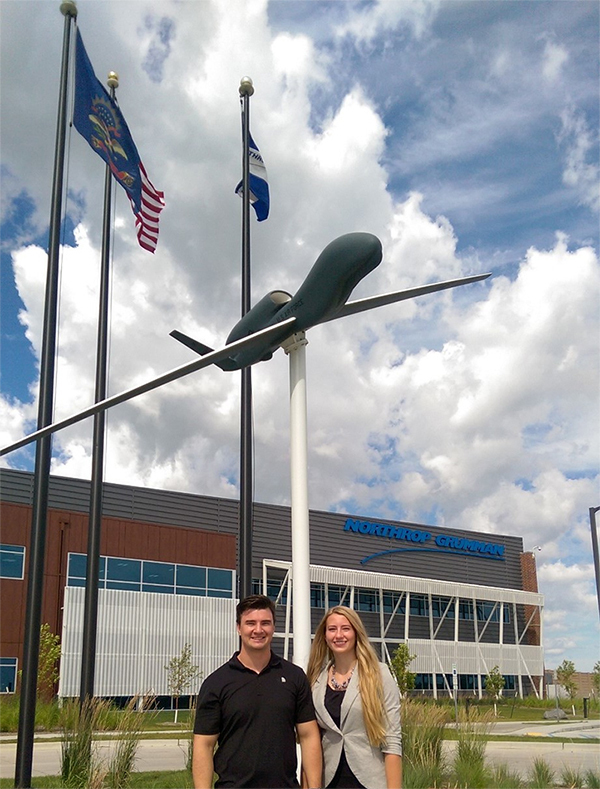 Wilson Lysford, a mechanical engineering graduate, and Megan Larson, an electrical engineering sophomore, stand outside Grand Forks’ Northrop Grumman complex. Both discovered the aerospace company through UND’s Career Fair. Photo by Misty Perter-Belch, Northrop Grumman. It was Wilson Lysford’s first day on the job at Northrop Grumman near Grand Forks. He wasn’t nearly as nervous as most new employees. He was ready to go because he’s been working as an intern there since January. Lysford, who graduated with a mechanical engineering degree in May, took advantage of internship opportunities and the UND Career Fair to get a head start on his future. Lysford was hired to be part of the vehicle engineering team, working on sensors for the Global Hawk unmanned aerial vehicle. Lysford also had two other internships – one in Perham, Minn., with Kit Masters, a truck part manufacturer, and one with Retrax, a truck bed liner manufacturer in Grand Forks. Especially helpful, said Lysford, was working with off-campus distance students. The College of Engineering & Mines, like most colleges, encourages internships and experiential learning as part of the One UND Strategic Plan . Megan Larson said her internship with Northrop Grumman has only reinforced her career goals. An intern since October, the electrical engineering sophomore from Jamestown is working on aircraft reliability and maintainability for unmanned vehicles. And she’s well on her way to her goal of being a role model for other women in STEM fields. In addition to being a member of the UND volleyball team, Larson is active in the Society of Women Engineers and the Institute of Electrical and Electronics Engineers on campus, and also works on cyber security challenges for the Data Energy & Cyber Systems research lab at the College of Engineering & Mines. She’s spoken to high school science classes and interned for Sen. John Hoeven. Larson said she connected with Northrop Grumman at the UND Career Fair. “They offered students the opportunity to interface with the company, and for hiring managers to get to know UND students,” she said, adding that she began networking with the representatives before being chosen as an intern. She said her internship experience has only reinforced what she wants to do after graduation.